Pew Center Survey shows rapid climb in the percentage of US Orthodox Jews - and their influence goes beyond their numbers. Although the overall percentage of Jews in the US has held steady for the last two decades at about 2.2 percent, the percentage who consider themselves Orthodox is skyrocketing. According to the Pew Research Center study, approximately 10% of the 5.5 million American Jews consider themselves Orthodox in comparison to the 18% who consider themselves Conservative, 35% Reform, and 30% no denomination. However, the Orthodox population is much younger. In the “grandparent" generation, those aged 56-73, only 5% are Orthodox. In the “parent” generation, aged 28-45, 15% are Orthodox. 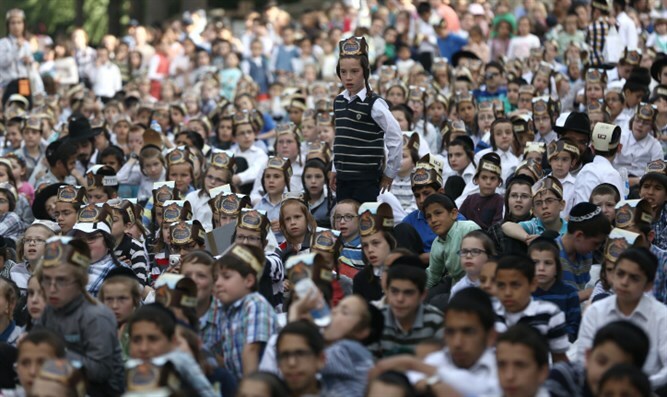 In the “child” generation, aged 0-17, 27% are being raised in Orthodox homes. In other words, over the course of 3 generations, the percentage of Orthodox among Jews in America has more than quintupled – from 5% to 27%. These findings are in alignment with a 2012 UJA-Federation study, which found that 60% of the Jewish children in the New York City area live in Orthodox homes. • Dramatically lower intermarriage rates: Just 2% of Orthodox married couples are intermarried vs 44% of American Jewish couples overall. • Dramatically higher birth rates: Orthodox families have an average of 4.1 children per family vs 1.9 children per family overall. • Dramatically lower age at time of marriage: 80% of Orthodox women aged 18-29 are married vs 20% of non-Orthodox Jewish women of the same age, according to a 2006 study by the American Jewish Committee. Furthermore, the influence of Orthodox Jews in America on the character of Jewish life goes well beyond their mushrooming numbers. 69% of Orthodox Jews, according to the Pew study, are members of a congregation vs 31% for Jews in America overall. 92% of the Orthodox contribute money to Jewish causes, vs 56% of Jews overall. When it comes to Israel, 91% of Orthodox Jews say they are somewhat or very attached to Israel vs 69% overall among Jews. 77% of Orthodox Jews have been to Israel, vs just 43% of Jews overall. According to the 2013 survey, just 30% of Orthodox Jews believe that a two-state solution could work, vs 61% of Jews overall who believe it’s a viable possibility. The study has implications for American politics as well, where the differences are also striking. Among Jews overall, according to the Pew study, 70% say they are Democrats or lean towards the Democratic Party, while only 22% are Republican or lean Republican. For Orthodox Jews, however, the balance is in the other direction: 57% are Republican or lean Republican, and 36% are Democrats or lean Democratic.